During this year’s Hot Stove season, one position that will be in hot commodity will be third base. There are eight teams that desperately need someone to fill their hot corner, four of which are playoff teams from a year ago. This is why I have taken time to rank the top five third basemen available along with their strengths, weaknesses and my scouting report on each of them. Funny thing is, that three of the top five aren’t even true third basemen which goes to show that this position is thin when it comes to true blooded third basemen. A fantastic 2009 season has set Figgins up to be paid a hearty contract this winter as he has established himself as one of the best lead off guys in the business. He’s a fantastic tone setter as he uses his speed and short, compact (slap) swing to make things happen at the top of the lineup. Does a great job hitting the ball where its pitched with some pretty good gap-to-gap pop. Good extra base guy due to his speed and ability to take extra bases. Likes pitches out over the plate and can struggle at times with hard stuff inside. While he’s a better fit as a utility player (can play all over infield including left field), he has made a home for himself as a plus defender at the hot corner with good reaction time, feet and hands. It’s funny how things even themselves out. After having a monster year in 2004 before becoming a free agent only to not live up to his paycheck in Seattle, he now ventures into the free agent market once more after a truly horrible year at the plate. Beltre swings off his back foot and generates all his bat speed and power with his raw strength. His swing has gotten longer and longer as time has gone on causing more holes to develop. This has made it more difficult for him to catch up to the heat and even worsened his bad habit of chasing sliders down and away. Aside from that he is an extremely dangerous power hitter who mashes the ball to all fields. While his bat has come and gone through the years, his plus defense is what makes him so valuable. Beltre has great range, fantastic reaction time and above average arm strength. Won’t get even near the payday this time as he did back in ’04. Tejada’s days playing shortstop look to be over as he just doesn’t have the range to play the position anymore. But he still posses good hands and a strong, accurate arm once he gets set which will translate very well to third base. Good at positioning self which too is going to benefit him greatly at the hot corner. As far as how he is at the plate, he has a quick bat and is very aggressive. Prefers the ball up in the zone and is vulnerable in on his hands. Doesn’t have the power he once had but still can drive the ball very well to the gaps and proved to still be a clutch hitter for Houston last season. Will fit in well as a six or seven hitter at this stage of his career. After a career year in 2008, DeRosa had a very disappointing year last season after battling a wrist injury. DeRosa’s value is definitely tied to his ability to play five different positions, the problem is he isn’t stellar at any of them. Has found a home a third base for the most part due to being a steady, surehanded fielder and having a very strong arm. Covers up his lack of range by positioning himself very well depending on hitter and situation. 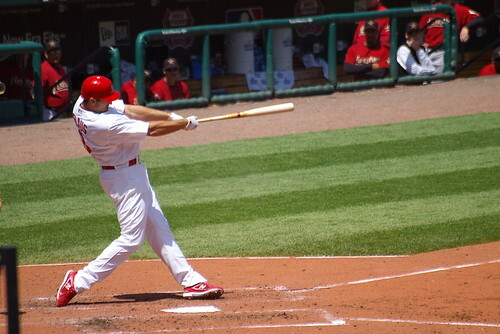 At the plate DeRosa has a short, compact stroke that he uses to drive fastball well to all fields. He is very balanced at the plate and has solid plate discipline with the ability to make adjustments to his approach depending on the count. Has been able to add power over the past few seasons which has made him more valuable and helps justify his playing third base. Glaus missed all but 14 games last season with injuries which makes him a bit of a question mark for 2010. With some injury problems in the past, teams have to be cautious with their offers to the big man. On the bright side, when Glaus is healthy he is a force in the middle of the lineup. He has a long swing and likes the ball down and out over the plate. Drives these pitches and has incredible power from right center on over to left. His kryptonite is sliders from righties away as he tends to roll over on them. Defensively he doesn’t have too much range at third base but helps make up for it with good hands and a very powerful arm. Teams always have the option to DH Glaus occasionally to keep him fresh which may be a very attractive option to American League clubs. You are currently browsing the The Diamond Cutter blog archives for the day Wednesday, December 2nd, 2009.